An evening to present the screening of two films by artists Elena Mazzi and Malin Pettersson Öberg, in conversation with independent curator Jonatan Habib Engqvist. The evening is carried out in relation to a residency at the Nordic Art Association (NKF) and will focus on the glass production of Italy (Murano, Venice) and Sweden (Småland). The films have not previously been screened in Stockholm. The screening will be introduced by director of the Institute Maria Sica and it will be followed by drinks. The event is organised in collaboration with the Nordic Art Association (NKF) and the Italian Institute of Culture in Stockholm, and with support by Iaspis, The Swedish Arts Grants Committee’s International Programme for Visual Artists. LACUNA – Land of hidden spaces is part of a bigger project, called Reflecting Venice; this intends to investigate the possibility of responding to recent years’ increase of environmental issues affecting Venice, in Italy. Through the application of an interdisciplinary methodology, Reflecting Venice explores technological innovation and its implications. Considering local context in conjunction with new environmental goals is beneficial in redefining their broader effectiveness and functionality. 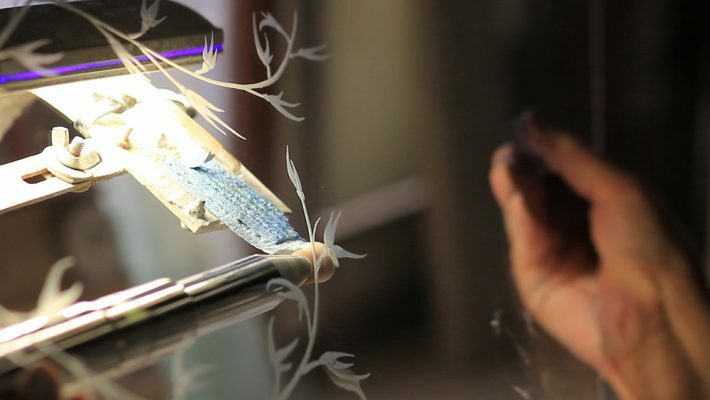 The video has the will to combine and intertwine the different ‘actors’ of the project: a prototype of a solar wall made with mirrors, referring to Archimedes’ inventions, the ancient tradition of engraved glass in Murano (Venice), and the fragile environment of the Lagoon, now in peril. What is the significance of glass making in Sweden and how did glass affect the construction of Modern society? 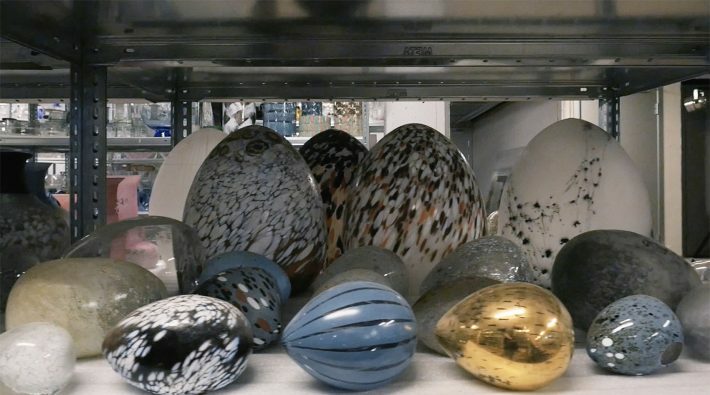 In her video, Att läsa glaset (Reading Glass), Malin Pettersson Öberg explores glass as a cultural product, invention, concept and association surface with a point of departure in an archive for Swedish glass production. Through glimpses from one slow camera movement along the shelves of the archive, we are met by tableware and art glass from the previous decade. To the camera’s concrete reading of objects on the shelves, a second reading of glass through history and literature is added, in the film’s soundtrack. Here, a fragmented narrative is constructed through quotes and references to a number of sources. At regular intervals, the visual flow is interrupted by black gaps, as if to remind us of the eye blinks or the camera that we look through. The film’s visual flow is accompanied by a musical score composed by Samuel Nicolas (2015). Att läsa glaset was conceived as part of the project Moving Mass (2015-2017), with support from Kalmar konstmuseum, The Glass Factory, Konstnärsnämnden and Kulturrådet. The film is distributed by Filmform.